Students will practice their reading skills by identifying text structure and distinguishing bias from fact. Choose an area of research; identify the text structure of at least two different texts. Summarize the texts by determining main idea and supporting details; determine author’s point of view and how it impacts readers. RL.4.6 Describe how a narrator’s or speaker’s point of view influences how events are described. RI.4.2 Determine two or more main ideas of a text and explain how they are supported by key details; summarize the text. RI.4.3 Explain the relationships or interactions between Lewis and Clark and the Northwest Tribes they encountered based on specific information in the text. RI.4.6 Analyze multiple accounts of the description and purposes of Celilo Falls, noting important similarities and differences in the points of view they represent. How did members of the Lewis and Clark expedition describe and interpret this place? How did American Indian peoples describe encounters with members of the Lewis and Clark expedition? Classrooms sets of selected excerpts of handout 3.12, “Childhood Memories of Fishing at Celilo Falls,” an article located in the Celilo Storypath. Classroom sets of Roberta Conner’s chapter “We Have Always Been Here,” in Lewis and Clark Through Indian Eyes, pp. 89, 91–101. Videos of “Native Homelands” and/or “Tribal Perspectives of American History In the Northwest,” from OSPI’s “Since Time Immemorial: Tribal Sovereignty in Washington State” website. Preparation: Make sure students have had a chance to find texts in your classroom or school library on the same topic. They may decide to read about something in their “Observation Chart” or keep going with the place they read about last week. Tie-In: Last week we learned about the importance of learning the history of the places around us. You learned about Celilo Falls, the Columbia River, and you learned to pronounce their traditional names. Entry Question: Is it possible to have two different ideas about the same place? Lead-In: Today we are going to learn how to determine point of view and factors that contribute to the author’s perspective. We will practice this very important skill over the next three days. Lesson: Recall Grandma’s description of Celilo from “I Wish I Could Have Seen the Falls.” from Episode 1 (reread select descriptions from the text). Now, let’s read from Lewis and Clark’s journal. They were there and traded there, too. As I read, draw what you envision. Introduce page 1 of the handout “Loaded Words Point of View.” Complete it together, noticing how language affects our opinions of people, places, or events. Focus on the advertisement portions as well as the parent points of view and loaded words before moving onto Celilo or student research texts. Point out that words are chosen on purpose to have an effect on readers. Be careful of “loaded”words. Today when you go book shopping, choose another text that is about your same place or at least the same area. They want us to believe as they believe and will choose words to persuade our opinions. HOMEWORK: Complete the “Loaded Words Point of View” worksheet. Begin taking notes from the texts you got today and prepare to share them with your group when you’ve finished (this will be early next week). Teacher models and reads aloud the difficult text so that students can then practice in pairs. *NOTE: You may only get through one or two sections of the large article; this is okay. 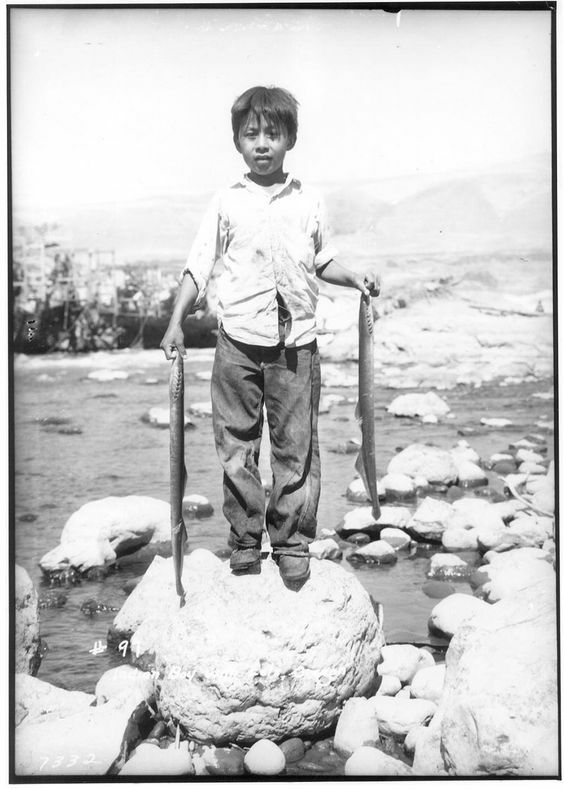 Class set of handout 3.12, “Childhood Memories of Fishing at Celilo Falls,” by Allen V. Pinkham, Sr. Episode 5 of the Celilo Storypath located at http://www.indian-ed.org/curriculum/elementary-school-curriculum/wa-celilo-falls-dalles-dam/. Carol Craig (Yakama) gathered this and many other images from postcards and photographic prints she found at yard sales and other unknown, ambiguous sources during the 1990s. 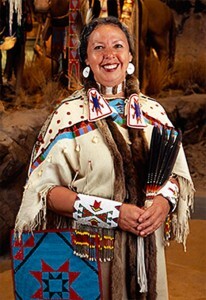 At the time she was employed by the Columbia River Intertribal Fish Commission, which is based in Portland, Oregon, and serves tribal members that reside within the Columbia River Basin. We now know that an author’s point of view really affects the description of places, people, and events. Authors use language to persuade us to believe what they believe. It is sort of easy to identify these loaded words when we are familiar with the situations. Entry Question: So, when an article is difficult—you will encounter a lot of writing whose intended audience is much older—how do you tackle that difficult text and still determine point of view and loaded words? Lead-In: Today we’ll practice with a relatively simple text we saw yesterday: Lewis and Clark’s journal entry about Celilo, and now we’ll tackle a more difficult text: “Childhood Memories of Fishing at Celilo Falls.” We’ll do this so that you know how to tackle the tough texts you will encounter over the next three weeks as you research a place in our community. Follow the Close Reading lessons in Episode 5 of the Celilo Storypath. Model questions as a class, then partners will ask each other, too. Close: See how asking yourself questions and comparing different articles gives you a better idea of a particular place, person, or event. Assessment: Exit Slip: Use “Childhood Memories…” and “I Wish….” Why are they so different from the journals of Lewis and Clark? Exit Slip: Identify the differing points of view of Celilo Falls. Explain how authors’ experience (or lack of it) impact their points of view. HOMEWORK 1: In your reading journal or on a piece of paper, sketch what you feel each of the authors really sees (depending on students’ reading and abstract thinking levels, you can define “sees” as what they physically see or what they value). HOMEWORK 2: Keep reading your research texts and taking notes on the information. Complete the “Loaded Words”handout for early next week to share with your research group. Students will define and identify author’s purpose and perspective using YouTube commercial examples, their own writings, and mentor texts. Tie-In: Yesterday, we tackled a difficult text that showed another perspective about Celilo Falls. This was really different from the Lewis and Clark Journal entries that describe Celilo. You also drew pictures last night about how Pinkham and Lewis and Clark “saw” the falls. Share them now. Why are they so different? Lewis and Clark weren’t there very long. Pinkham and Craig view the place as home, whereas Lewis and Clark were visitors and did not learn about the importance of this place. Entry Question: Once you understand a different author’s point of view, what do you do next? What is the author’s purpose? Lead-In: Once you understand an author’s point of view, you can better identify their purpose. When you do that, you have a better idea of what to believe—and to know when you are being manipulated. Recall some favorite commercials (have some humorous ones loaded on YouTube or use this video on author’s purpose commercials or an elementary explanation of logos, ethos, and pathos. Grandma: To teach/inform (Carol Craig: to inform/entertain). Pinkham, Jr: To inform, persuade. Lewis and Clark: To inform. Combine their purpose with their perspective/point of view. Native authors: to inform audience about cultural, spiritual, and generational importance, as well as economic. Lewis and Clark: to inform audience about economic importance. Assessment: Exit Slip: What are author’s purpose and perspective of the texts we read in class today? Of one of your research texts? HOMEWORK: Continue taking careful reading notes on your research text. Make an entry tonight about the author’s purpose and perspective. Students will determine how an author’s purpose and perspective inform their reading. Tie-In: Yesterday we identified author’s purpose and perspective. We saw videos on how purpose makes a difference on how we see commercials, for example. We have also seen how author’s perspective can affect the way someone presents information. Entry Question: Why is this important for us to know? Lesson: Today we will talk about just that: why readers need to know how author’s perspective and purpose affect how we read and how we make meaning of a text so that we can draw accurate conclusions about the things we read. Model analysis with Pinkham’s section 1. Have students continue reading, asking each other questions about the article— section 2 (higher level learners might get through section 3; emerging learners will need to work with the teacher in small reading groups). HOMEWORK: As you read your own work, create at least five really insightful response Post-It Notes. Be prepared to share with your partner. What does knowing author’s purpose and perspective teach me about how to read the text? Typically, you believe the one who has had the most experience in a certain place, but not always. In order for us to really understand a place and its importance to people, we have to analyze documents. Students identify how bias and perspective impact the interpretation of a place or event. Class set of Lewis and Clark Through Indian Eyes, excerpt from p. 89, Clark-Conner Accounts handout. Class set of Lewis’ 1806 journal entry. Entry Question: Today, we are going to learn how to compare two differing perspectives in order to make meaning and draw conclusions. 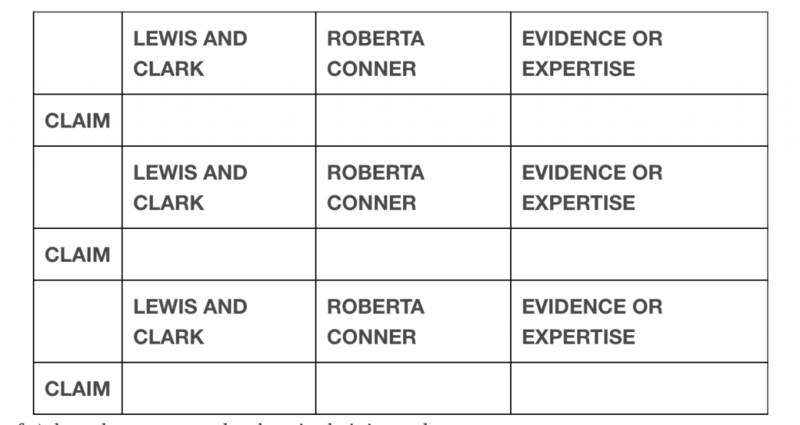 This all leads to a better answer to yesterday’s question, “Who do you believe?” And so another part of that question must be, “Who has expertise?” (Explain what expertise means and have students write it in their journals). Lead-In: No one can tell you who or what to believe. You get to decide that. When you read about the places around here that you are researching, you get to decide what perspectives are more important. That will lead you to the conclusions you draw. Let me show you one way it’s done. Distribute Clark-Conner Accounts handout. Read Clark’s account of his “visit” with the Walla Wallas in 1805. Make sure students understand it, identify any loaded words, and determine his perspective and purpose. Now, read an excerpt from p. 89 of the chapter “We Have Always Been Here,” from Lewis and Clark Through Indian Eyes. As you read, have students describe Conner’s perspective of the “visit.” Have students discuss who appears more believable? Why? Why not? Based on what? Ask students to copy the chart in their journals. As you read, complete the chart. Use the handout so students can reread texts as needed. Ask students to turn and talk about who has greater expertise as you read accounts. She’s been there a lot longer. Family has been there for thousands of years. She’s from the culture who thrived/s there. Are there any conclusions we can draw from this lesson today? Just because you’re famous doesn’t mean you’re right. Just because you did not live during the same time does not mean you are any less an expert. Living in a place gives you greater expertise than just visiting and observing and drawing conclusions based on observation alone. Take those conclusions with you as you research your place. Make a chart just like I did today. You might have more than two sources, so make sure you make enough columns for each. Assessment of last night’s homework: Have students turn in their best Post-It Notes about Pinkham’s or their own researched articles they have been reading. Determine how many students are at Level 1 (refer to the handout) and re-teach nonfiction reader response in small groups tomorrow as needed. Assessment for today: Exit slip: What makes an “expert” truly an “Expert”? Why? Write paragraph on why it is important to consider these three terms when drawing conclusions about what you read.